Choose a propane fireplace insert and you’ll get the convenience and efficiency of a propane hearth inside the beautiful framework of an existing masonry fireplace – talk about having the best of both worlds! But there’s more to a propane fireplace insert than meets the eye. Here are five trends in fireplace inserts that we’re seeing in 2018. Trend 1: More realistic flames – Better gas burner technology means more realistic flames that flicker and dance just like a wood fire. Don’t believe us? Let your eyes be the judge at one of our Connecticut showrooms. Trend 2: Smarter fireplace inserts – Modern gas fireplace inserts can be programmed to turn on and off at specific times; you can even program temperatures you want to maintain at specific times of the day or night (see Trend 4). 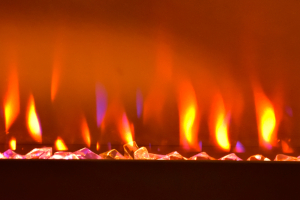 Trend 3: Using propane fireplace inserts as high efficiency backup heat – Today’s fireplace inserts can have efficiencies that measure well into the 80s – a far cry from the 30 or so percent efficiency of a wood fire. That makes a propane fireplace insert a great source of backup or supplemental heat in an electric-heated home. Trend 4: Adjustable heat – Need to adjust the output of your fireplace to do double duty on a freezing winter night, or back down to take the edge off on a crisp autumn day? Today’s fireplace inserts with multi stage turn down controls can do that. Trend 5: More sizing variety – Have a masonry fireplace with an opening too narrow or too shallow to fit a typical fireplace insert? Smaller inserts are becoming more common. Trend 6: Fireplace inserts with blowers – Good news for people heating big spaces: some fireplace inserts now come with multi-speed blowers to push warm air to the far corners of a room. Trend 7: Masonry fireplace refinishing – Some people have made dramatic and beautiful changes to their existing masonry fireplace without breaking the bank. Check out some of these great ideas on Pinterest and Houzz! Turn your drafty masonry fireplace into a stylish, efficient, push-button hearth with a propane fireplace insert! Visit on of our locations in Danbury, Guilford, Norwalk, Torrington, Waterbury, or Suffield to see our full line of propane fireplace inserts, fireplaces, and log sets on display!